Reading, April 2, 2019 State Sen. Judy Schwank (D-Berks) is hosting an event to honor Rev. Martin Luther King Jr. The event is being held at St. John Missionary Baptist Church at 436 S. 7th Street in Reading at 1 p.m. on Thursday, April 4. 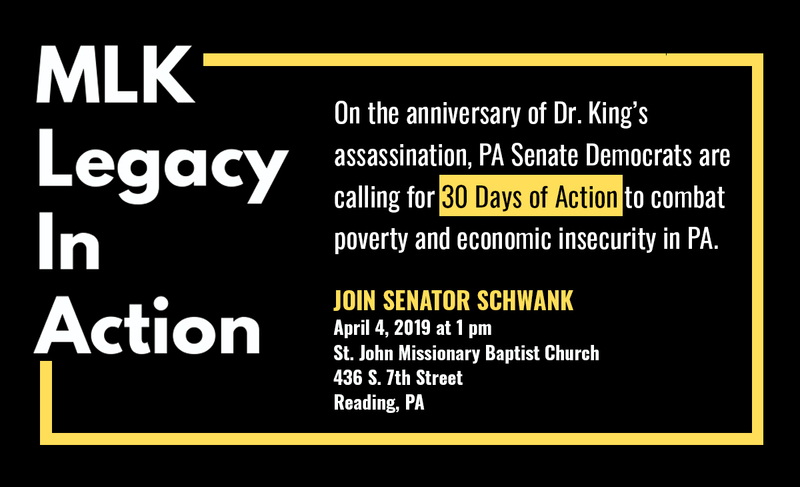 The event is a remembrance for the 51st anniversary of Dr. King’s assassination and marks the beginning of Pennsylvania Senate Democrats call for 30 days of action to combat poverty and economic insecurity in the Commonwealth. Media and the public are invited.